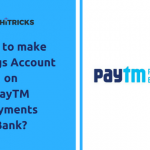 Home » Android » How to make a Savings Bank Account on PayTM Payments Bank? PayTM (One97 Communications) has introduced their own Payments Bank, approved by Reserve Bank of India. With this PayTM Payments bank, you can create a savings or current bank account, get your debit card, withdraw money from atm, send to and receive money from other banks and do internet banking and other banking services easily. This is a blessing for a lot of individuals, especially students who can now get a bank account with debit card easily and shop from anywhere in India. As a student myself, I feel this new feature introduced by PayTM Is very useful. I study in college, and still have friends who don’t have a bank account, or have one but don’t have a debit card or internet banking facility. There are several restrictions from family for using them, hence, paying online for services isn’t always very easy to them. But, with the launch of PayTM Payments Bank Service, I am pretty sure these issues will finally get eradicated. Every person can at least have a secure account where he can receive money from others and use that money anywhere he wants. Well, PayTM was planning for this Payments bank approval from years, but didn’t get all necessary approvals. Well, we all came to know about this Payments bank and that it is launching ‘soon’, from May 2017 onwards. Well, the good news is, the end of all our waiting is near. RBI has finally approved PayTM’s request to join the Payments Bank sector. 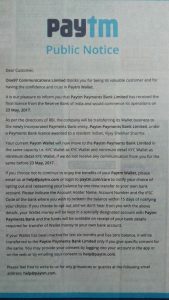 On 16th May, PayTM published a Press Release on different newspaper and announced that it is finally launching from 23rd May. One97 Communications Limited thanks you for being its valuable customer and for having the confidence and trust in Paytm Wallet. It is our pleasure to inform you that Paytm Payments Bank Limited has received the final license from the Reserve Bank of India and would commence its operations on 23 May 2017. 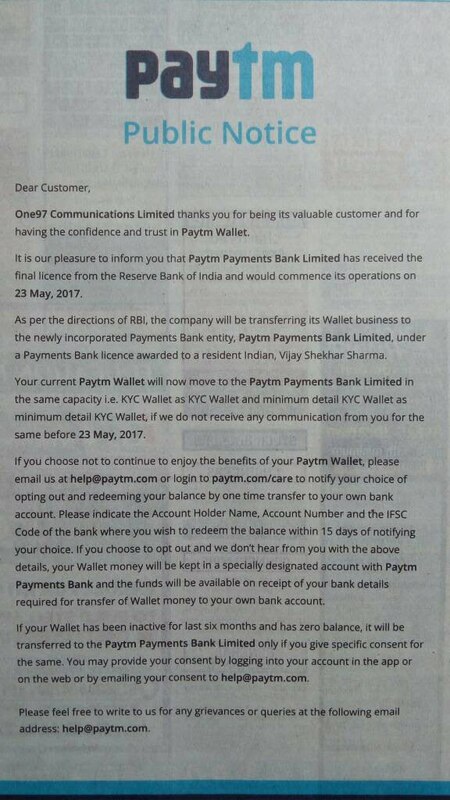 As per the directions of RBI, the company will be transferring its Wallet business to the newly incorporated Payments Bank entity, Paytm Payments Bank Limited, under a Payments Bank license awarded to a resident Indian, Vijay Shekhar Sharma. Your current Paytm Wallet will now move to the Paytm Payments Bank Limited in the same capacity i.e. KYC Wallet as KYC Wallet and minimum detail KYC Wallet as minimum detail KYC Wallet, if we do not receive any communication from you for the same before 23 May 2017. If you choose not to continue to enjoy the benefits of your Paytm Wallet, please email us at [email protected] or log in to paytm.com/care to notify your choice of opting out and redeeming your balance by one-time transfer to your own bank account. Please indicate the Account Holder Name. Account Number and the IFSC Code of the bank where you wish to redeem the balance within 15 days of notifying your choice. If you choose to opt out and we don’t hear from you with the above details, your Wallet money will be kept in a specially designated account with Paytm Payments Bank and the funds will be available on receipt of your bank details required for transfer of Wallet money to your own bank account. If your Wallet has been inactive for last six months and has zero balance, it will be transferred to the Paytm Payments Bank Limited only if you give specific consent for the same. You may provide your consent by logging into your account in the app or on the web or by emailing your consent to helpepaytm.com. Renu Satti, the vice president at PayTM will become the CEO at PayTM Payments Bank. What is a Payments Bank? How is it different from a Regular Bank? Well, before I tell you about making a Bank Account on PayTM Payments Bank, I should explain to you about the term ‘Payments’. I keep telling Payments Bank, but what exactly is it? And how is it different from a normal bank account? Well, no matter how useful PayTM Payments bank is, if you do a lot of transactions a month, then you will need a regular bank account with any other banks. This is because in PayTM Payments Bank the maximum amount of money you can keep is 1 Lakh only. But if you think closely, that’s not a bad thing at all. Because most of us already have a bank account to keep most of our money, having a PayTM Bank Account will enable us to do our daily transactions using it, and keeping our Bank Account untouched. Also, those who can’t make a bank account due to lack of money, they can easily opt for this payments bank, as the minimum amount you need to keep on your bank is just Rs1. That’s a good thing. Normally a bank provides additional services other than just keeping your money, like offering Loans, Insurance services, Mutual Funds, Pension Funds etc. But, a payments bank is not allowed to provide these services directly. No lending allowed. But well, there is a workaround in case you want to avail them. PayTM has partnered with other banks and financial institutions to offer these services to their customers via them. It will provide you a seamless experience of PayTM Banking. So, in short, what you will benefit from PayTM Bank is that you are going to get a Debit Card to shop from anywhere using your PayTM Wallet. The other wallet services like sending payments to and receiving payments from your friends will continue to work normally like earlier. YOU MAY ALSO LIKE: How to transfer PayTM Cash Wallet Balance to Bank Account? Making a Savings Bank Account on PayTM Is easy. But you need to have KYC Documents for verification purposes. Below I am writing the step by step guide to make your PayTM Payments Bank Account. At first, create a PayTM Account if you did not create yet. Visit PayTM Website or Download PayTM App and sign up for a new account. PayTM will ask your profile details like your Mobile Number, Email Id, Date of Birth etc. State them correctly. Do not enter wrong details over there as PayTM will verify them using your KYC Documents before creating your Savings Bank Account. Now PayTM will send an OTP on your mobile by SMS. Confirm that to verify your mobile number. PayTM will also send an email verification link on your email id. Click on that link to verify your email id. After you have made your PayTM Account, you can add up your home address on your profile. It will help you choose your delivery address quickly when you purchase anything. You can do that from PayTM Settings. To add up your credit card or debit card inside PayTM, go to PayTM Wallet and first choose to add any amount of money in your wallet. You can choose as low as Rs10. On the next page, you can enter your card details and choose to save them for future transactions. Next, you need to verify your identity to PayTM by submitting your proof of identity, proof of address and photo to PayTM. This can be done by filling up the KYC Form given by PayTM. You can find it here. Basically, you need to download the KYC form given there, take a print out and fill up the form. Attach a passport size photo to the form in the given area. Next, you need to take photocopies of your proof of identity and proof of address. Now you can request PayTM for wallet upgrade. Requesting PayTM to come to your house: A PayTM Personnel will visit your house and collect the documents from you. He will also see the original proof of identity and address documents directly from you. Visiting your nearest PayTM Office: You can visit your nearest PayTM Office carrying the documents and the original Proof of Identity and address. They will collect the documents from you and see the original ones from you there. Copy of your PAN card (optional) if you want to spend more than Rs. 50,000/- in a single transaction. The Documents needs to be self-attested. That is, you need to put a signature on the photocopies of the documents. Start your signature from inside your document in the photocopy and finish outside the document on the paper. Note: If you choose to submit your Aadhar Card as proof, then you can opt for eKYC based verification from PayTM App. It will take your Aadhar and Mobile No and verify your identity instantly. 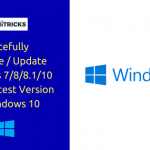 Your upgrade will be updated in no time. The time of upgrade can take up to 72 hours. This step is the main step to create your savings account on PayTM Bank. RBI requires all PayTM Bank Account holders to verify their identity using KYC Form and appropriate document submission. Hence upgrading your wallet is a helpful way to make your account pre-verified and making ready towards migration to PayTM Payments Bank. The PayTM Payments Bank is starting from 23rd May 2017. Once PayTM Bank services start, PayTM will add an option in their app to open a bank account from their PayTM Wallet. You need to complete your KYC and you can sign up for PayTM Bank digitally. If your PayTM Wallet is not upgraded yet, you need to complete the KYC Verification at first to start your bank account. Else your Wallet won’t be migrated to the PayTM Payments Bank Account. At first, you will get an email from PayTM notifying that the PayTM Payments Bank has started and your wallet will be migrated very soon. If you wish to join PayTM Payments Bank, you don’t need to do anything. Your wallet will be migrated to the PayTM Payments Bank automatically within a few days. But, if you wish NOT TO JOIN, you can manually cancel the migration by sending a mail to [email protected] with your Registered Email and Phone Number mentioning that you don’t wish to join PayTM Payments Bank. Note: If you don’t choose to move to the PayTM Bank, your wallet will be closed. You can’t make any transactions using your PayTM Wallet. You can, however, continue to use the PayTM Website and its services like Movie Tickets Booking, Recharging, DTH Payments etc and use your bank cards for the same. But you cannot use PayTM Wallet to pay on Zomato or Uber etc. After your migration to PayTM Payments Bank is complete, you can start banking with PayTM Payments Bank easily. A Welcome Kit with instructions to use the PayTM Wallet. The Banking Kit will reach at your home directly. It may take up to 2 weeks to reach you after your Bank Account has been created. Kindly wait for it to come. Congrats! Now you are officially a PayTM Bank customer. Start paying anywhere and everywhere. Keep your cash secure without worries. Have questions to ask? Don’t worry. Everyone does. In fact, after writing this post, I got a lot of common questions from my friends. I listed the most common questions over this PayTM Payments Bank FAQ section. Have a look there. I guess most of your problems will get solved. Okay, I hope all your queries regarding PayTM Payments Bank has been resolved. And now you can easily create your Savings Account. 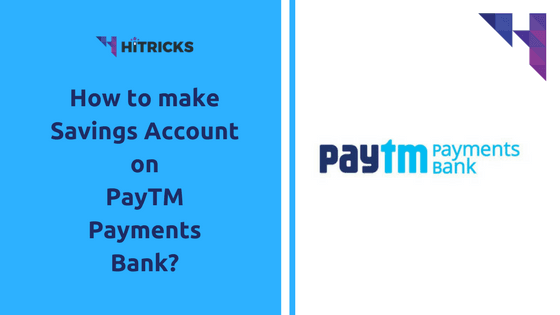 Did this post help you out with your queries regarding the PayTM Payments Bank? If you have further queries drop a comment below. I will try my best to assist you. Well, that’s all for today. I will be back soon with another interesting article. One time you are saying that But according to Indian Law, Payments Bank customers should be able to withdraw money from ATMs, With this PayTM Payments bank, you can create a savings or current bank account, get your debit card, withdraw money from atm. The other time you are telling that you will get a physical plastic card from PayTM which will work as a debit card. However, you cannot use that to withdraw money from ATMs. I am confused that whether I can withdraw money from atms or not. You only tell me whether they will give ATM Pin or not, because that is only necessary to withdraw money from atm. You have told lie to us that we will get a Banking Kit from PayTM because when I queried paytm that when will I get my banking kit. They replied that we currently do not provide physical debit cards and cheque book. Then why you told lie?